I try to capture here things I see on the internet that I want to be able to access again. Thoughts create emotions, those emotions guide our behavior. For example, the thought “I’m never going to succeed at school, why should I even study?” creates emotional distress. That emotional distress can easily trigger coping behaviours like binge watching House of Cards or mindlessly refreshing Instagram every five seconds. That’s just the beginning of the spiral, though. After you’ve been binge watching TV or staring at your cell phone for an hour, you’re going to have a new thought, “Damn, I shouldn’t have wasted an hour on my phone, I’m so stupid, I’ll never pass that class.” This thought creates more emotional distress, which leads to more coping behavior…. Our thoughts don’t directly lead to behaviours, they create emotions which lead to behaviours. This creates a trap that is exceedingly easy for us to fall into. … the emotion we feel because of this thought isn’t motivation, but distress. What do humans do when they feel distressed? Cope. What are the most common coping behaviors used in 21st century life? Electronic media, food, and drugs. “When I speak with physicians, I sometimes ask them to predict the effects of showing smokers graphic warnings on cigarette packs. In general, they believe that the images will decrease smokers’ desire for a cigarette and motivate them to quit. But studies show that the warnings often have the reverse effect. The root of our suffering is our belief that we can (or even should) eliminate negative thoughts and emotional pain. The thought that suffering is ‘bad’ or ‘negative’ is itself a negative thought. 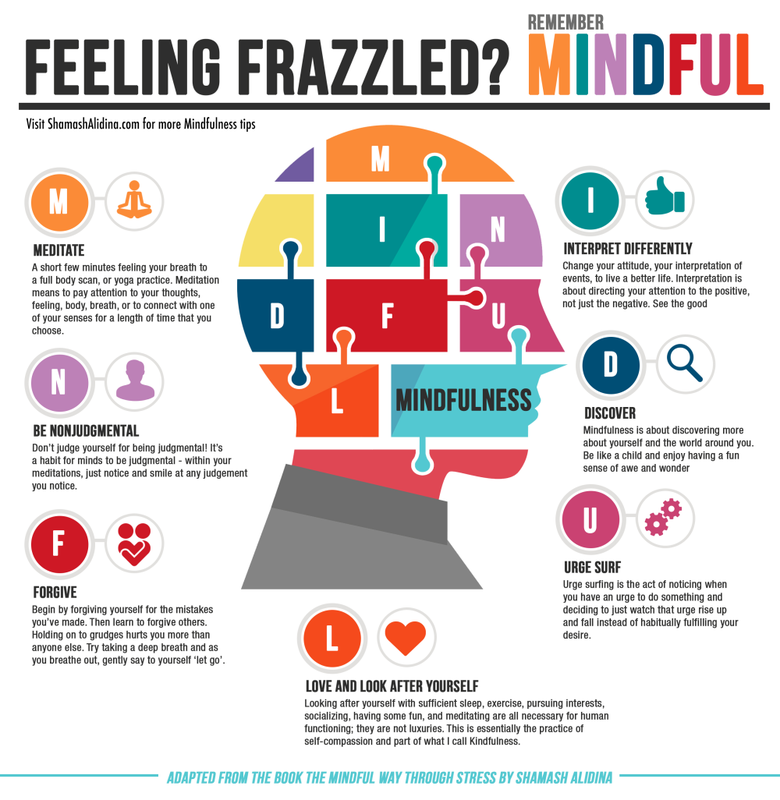 This way of thinking makes stress a trigger for more stress…. In Acceptance and Commitment Therapy, cognitive fusion is a state in which we become entangled with our thoughts and we lose the ability to distinguish between thoughts and objective reality. To escape this spiral of stress and suffering that we get trapped in, we must learn to relate to our thoughts differently. … To escape the vicious cycle of negative thought, you must accept the negative thought as it is….Once you learn to accomplish this effectively, you will still have negative thoughts, but they will drift away like clouds on a gentle breeze instead of darkening into a storm of emotional suffering. …Labeling is a mindfulness technique that allows us to defuse from our thoughts, it helps us identify our thoughts as subjective opinions instead of objective facts. Either during a sitting meditation or any time throughout the day, notice your thoughts. The point of labeling is learning to become aware of your thoughts so that pain does not need to become suffering. You may notice that you are now able to accept stress as something that happens, and now you can experience it without needing to avoid it through coping. I’ve realised that I often try to motivate myself by focusing on the bad. It rarely works. Mind you rewards don’t work for me either. Promising myself x if I do y never gets me anywhere. I’m still trying to understand what motivates me to do something. Maybe fear? Fear of being poor? Beyond that my motivation tends to be extrinsic. I will do stuff to make other people happy, but for myself? I’m not that motivated. I will happily lie around reading books or going for walks, but I’m not super motivated to achieve or create or get rich or… anything. Sometimes I think being extremely bored, or not working and having heaps of spare time will do it. Or maybe I just don’t want to do anything much, and I have to accept that? Maybe I am a really enlightened Buddhist, completely content in my present day life without any major attachments? Maybe I am living the dream? The comfortable suburban middle class dream. How do you know that you are ok as you are? How do you know when you should change?